The first tweet is from World Meteorological Day, a day that is celebrated on the 23rd March annually. 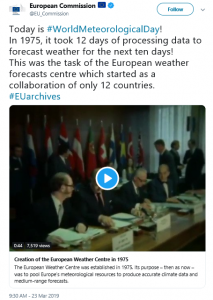 This year, the European Commission highlighted the day in a tweet with archive footage of the signing of the agreement in Brussels to create a European Weather Centre (i.e. @ECMWF) in November 1973. 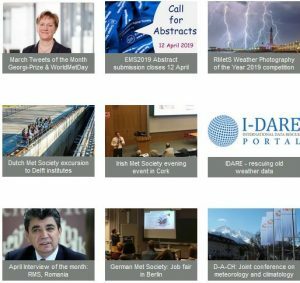 Our second Tweet of the Month involves news from an EMS Member Society, the German Meteorological Society (DMG). 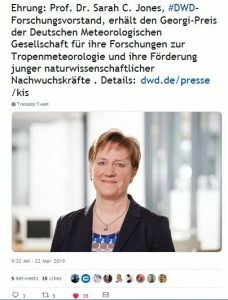 Prof. Sarah Jones has been awarded the Georgi Prize of the German Meteorological Society for her research on tropical meteorology and her promotion of young scientists. Prof. Jones is the head of the Research and Development Division of Deutscher Wetterdienst, the German national meteorological service. The prize was awarded in Garmisch-Partenkirchen as part of the triennial DACH Meteorology Conference. We would like to engage with more Member Societies and Associate Members through Twitter. We have started to follow the accounts of some Societies but we may have missed some. If you are the Twitter administrator for a Member or Associate Member of EMS, please consider following us at https://twitter.com/europeanmetsoc. To ensure we see a tweet of interest for the next Tweet of the Month, please add the hashtag #emstweetofthemonth.